If you’re over 40, you’ve probably noticed your eyes have changed. Most notably, presbyopia — the normal, age-related loss of near focusing ability — usually develops at this time. Reading: good for near vision only. If you look up at a computer screen or across a room, your vision will blur while wearing glasses. Bifocal: an older option wherein the lens is divided into two distinct sections for near and distance, but provides no correction for mid distance. Varifocal: Clear and sharper vision at all distances. The convenience of having natural vision at all distances in one pair of glasses. Great cosmetic appearance with no visible line on the lens, unlike bifocal lenses. With progressive lenses, you can look up to see clearly across the room and in the distance. You also can look ahead to view your computer in the intermediate zone and drop your gaze downward to read and do fine work comfortably through the near zone of the lenses. These lenses need lot of expertise and skilled personnel to fit it in the frames. Markings and measurements are utmost important for quick adaptation and for best utility. Eye Care Centre is known for its excellence in fitting the progressive lenses with modern and sophisticated fitting lab. Eye Care Centre is an optical choice of all sections of the society where all types of progressive lenses are dispensed. Eye Care Centre deals with international brands like Essillor Nikon, Zeiss and Freedom lenses. Eye Care Centre provides customized progressive lenses based on need and requirement. 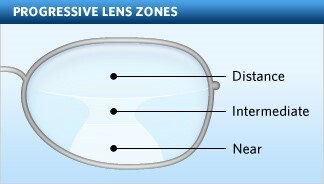 Example computer users requires wide intermediate zone so they need a progressive lens design which has long intermediate corridor. Some people who read extensively needs larger reading area designed progressive lens and some people who drives extensively needs larger distance area designed lens. Progressive lenses also are available in a wide variety of materials, including regular plastic and glass, polycarbonate, high-index and Photochromic lenses. Eye Care Centre also provides progressive lenses for smaller trendy, designer and fashionable frames. Book your online free eye examination and our well experienced Optometrists will be very privileged to help choose a right pair of spectacles lenses and recommend you suitable lens designs based on your needs and lifestyle.